ICV Live Webcasts Riverbed Systems Live Kickoff event in San Francisco ICV was chosen to provide Live Webcasting services and secure Media Portal web development for Riverbed Systems at their 2013 Sales Kickoff event. 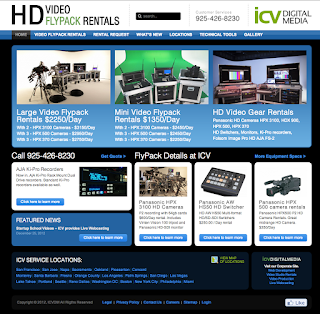 ICV just launched our dedicated Video Flypack Rental website. The website was designed to be a simple, easy to navigate site for choosing the right video flypack rental package from ICV. Operating manuals for all of the key video gear such as the Panasonic HS 450 HD/SDI switcher, the Panasonic AW HS50 switcher, The Ki Pro recorders. Our available HD Camera rentals are listed with specs and prices. We've included lots of helpful info even if you are not ready to rent a video flypack right now. You'll find lots of pictures of the gear too. And we publish our prices online so you don't have to call, email or shop around. We have the best price for the best packages.